Combine and save with iVenture Card and visit Top Sydney attractions. 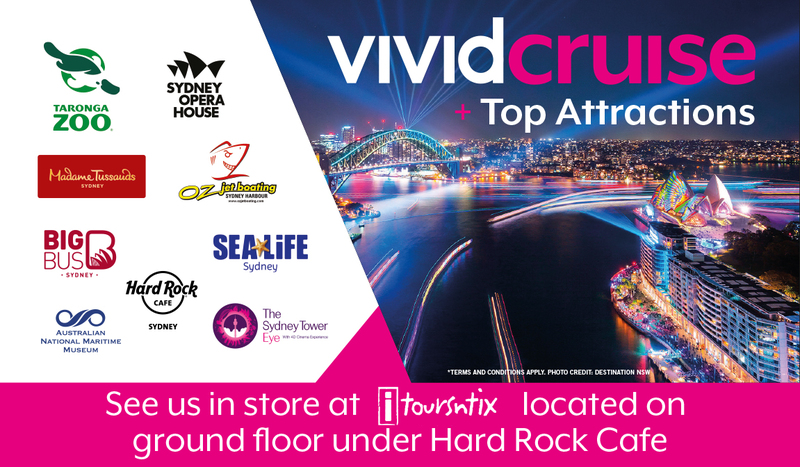 See more of Sydney with your Vivid Cruise and attractions pass. Take in breathtaking harbour views and the spectacular Vivid Light Show from our floating glass venue aboard the Bella Vista this Sydney Vivid Cruises 2019. Join our 2hr cocktail style dinner cruise and take in the colourful light playground featuring 3D projections, interactive art sculptures. Take in the spectacular views of the light show, whilst sipping on your welcome drink of house beer, wine or soft drink and enjoying the variety of food on offer from our standing buffet dinner featuring an array of tasty treats. Then choose from over 30 top attractions including Oz Jet Boating, Taronga Zoo and Sealife Sydney Aquarium. A must for every Sydney-sider or visitor looking for something refreshing this winter.